While I certainly know of the power of the Yarn Harlot, I’ve never personally experienced it! Big thanks to everyone who has downloaded the Just Enough Ruffles pattern. Unfortunately Ravelry seems to be running a bit behind at the moment and is taking a few minutes to send out download emails. So if you haven’t received a download email within 10-15 minutes, shoot me an email – but give it that couple minutes to catch up, okay? I’m pretty certain that all the emails are actually going out, but with a bit of delay. Oh, how I love tweed! Great colors. I want a sweater coat, my daughter wants one, and so does my sister. I can’t wait to see yours! I must have missed the Just Enough Ruffles pattern (how, I don’t know! ), so I’m going to check it out now. 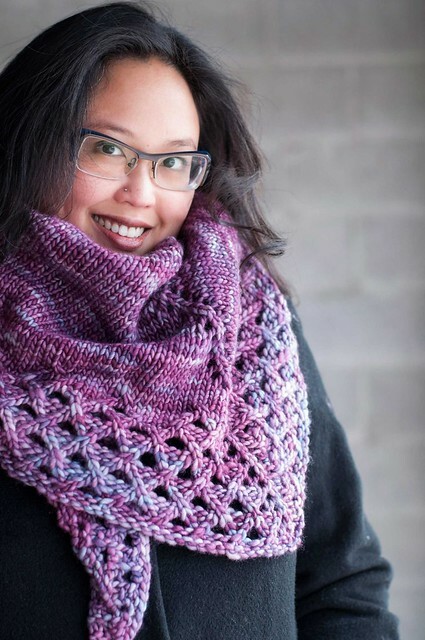 I love the Just Enough Ruffles scarf. I knitted one last weekend and I can see me knitting a second one real soon. Very nice pattern! I had seen this scarf before on your site Laura but didn’t go through and purchase it. When I saw it last night on the Yarnharlot I went-Oh that’s one I wanted to make!-I just got my download and can’t wait to go home and look through my stash to start on it. Thanks! It is a beautiful scarf. After I finish up my holiday knits I may make one for myself. Congratulations on the pattern success. I saw A stunning one made by one of my Knit Group buddies in a Turquoise Malabrigo Silky Merino and a gorgeous red one made by a blog buddy. With all the endorsements, including Harlot’s well, it’s in the Queue!! I must admit I missed the scarf entirely on your earlier post because I was so irritated by your comment about California. Please don’t lump us all into one bag – there are a lot of Californians who voted no on the ban for gay marriage; sadly, not enough. But now that I’ve had a chance to take a send look, it is a very nice scarf! The Yarn Harlot’s power is mighty! Thank goodness she mostly uses it for good not evil! saw it on YH blog and had to jump in and get a pattern for myself. It’s the perfect pattern for all of the handspun that I have been hording!!! Congratulations on being Harlotted! I just downloaded myself – was considering anyway, but she pushed me over the edge. :) It’s a lovely pattern and I’m so glad it’s getting some recognition! Thank goodness that YH agrees with the rest of us who bought the pattern. And I just finished my first one from it yesterday. I am doing another now. Question….I did mine out of Brown Sheep Lamb’s Pride. I think I will steam block it. How did you block yours to not mess up the ruffle?